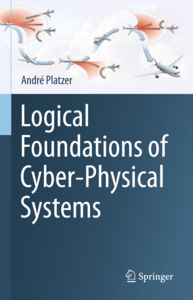 My research develops the logical foundations of cyber-physical systems to characterize their fundamental principles and to show how we can design computers that are guaranteed to interact correctly with the physical world. The solution to this challenge is the key to enabling computer assistance that we can bet our lives on. I pursue this challenge with the principled design of programming languages with logics that can provide proofs as correctness guarantees. Whether in cars, aircraft, or robots, the decisions that their computer programs reach have a crucial impact on all of us and they have the potential to make the world a better place. Computer programs can help us drive cars, help pilots fly aircraft, and enable robots to help the humans that they are interacting with. Along with these exciting prospects comes the responsibility to get the programs correct, though, which is quite a difficult challenge in light of the vagaries and uncertainties of the physical world. 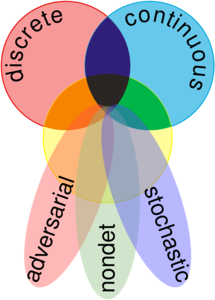 The design of mathematically grounded programming languages for dynamical systems that make it possible to unambiguously describe the behavior of a computer control program and its interaction with a physical model and to reason about its effect in logic. The design and realization of practical proof systems for those logics that make it possible to efficiently analyze the safety of a dynamical system. Making use of these capabilities by analyzing challenging applications in our prover KeYmaera X.
Logics of dynamical systems study logics and proof principles for properties of dynamical systems. Dynamical systems are mathematical models describing how the state of a system evolves over time. They are important in modeling and understanding many applications, including embedded systems and cyber-physical systems (CPSs). CPSs combine cyber capabilities (computation and/or communication) with physical capabilities (motion or other physical processes) to solve problems that no part could solve alone. Cars, aircraft and robots are prime examples, because they move physically in space in a way that is determined by discrete computerized control algorithms. Designing these algorithms to control CPSs is challenging due to their tight coupling with physical behavior. At the same time, it is vital that these algorithms be correct, since we rely on CPSs for safety-critical tasks like keeping aircraft from colliding. 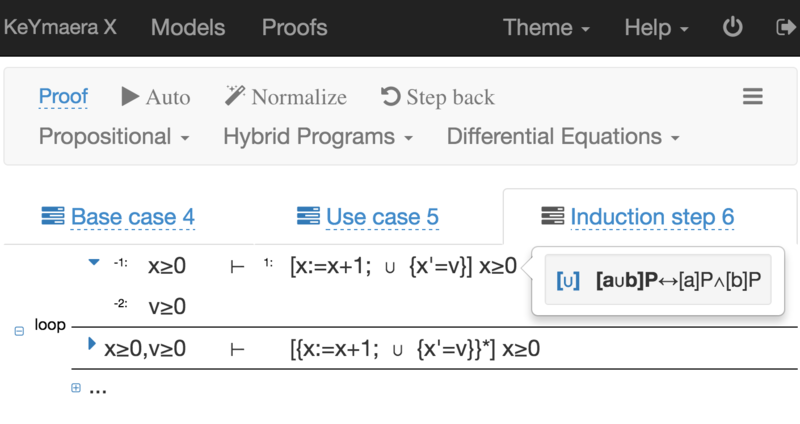 KeYmaera X is our theorem prover for logics for dynamical systems, especially hybrid systems with mixed discrete and continuous dynamics. Reasoning about complicated hybrid systems requires support for sophisticated proof techniques and efficient computation. KeYmaera X allows users to specify custom proof search techniques as tactics, execute tactics in parallel, and interface with partial proofs via an extensible user interface. Practical applications of cyber-physical systems can have a huge impact on society if they are safe, which is what logic and programming language techniques can help ensure. Conversely, applications give rise to many interesting challenges and insights on how reasoning about CPS can be mode more efficient. This gives us a dual interest in applications, for the sake of finding out how to safely design CPS as well as as an inspiration for new reasoning principles.